At the end of 2007 the National Video Archive of Performance recorded its 200th stage production. Jill Evans, their Video Archive Producer, provides an overview of their activities. About the Author: Jill Evans was The National Video Archive of Performance’s Video Producer. The National Video Archive of Performance, created by the Theatre Museum in Covent Garden (now relocated to the main Victoria & Albert Museum building in South Kensington and retitled ‘V&A Theatre Collections’) recorded its 200th production at the end of 2007. The catalogue includes West End hits like Equus starring Daniel Radcliffe, Royal Shakespeare Company and National Theatre productions like The Alchemist, classics, pantomimes, musicals, physical theatre and fringe. We had hoped to celebrate this milestone with a recording of either Michael Grandage’s Othello or the RSC’s production of King Lear with Ian McKellen (especially because our first recording in 1992 was the RSC production of Richard III – with Ian McKellen). The fact that we were unable to record either illustrates both the residual resistance to the very idea of recording the ephemeral art of theatre as well as some of the major practical problems we encounter during the process. But first some history. When Margaret Benton became Director of the V&A Theatre Museum in 1990, she was aware, thanks to her background in television, that the technology was finally at hand for the recording of live performance. Not only would such recordings breathe life into exhibitions at the Museum and provide researchers with an audio-visual memory trace of a performance to complement the traditional objects in our archive collections, but they could revolutionise the teaching of drama as performance rather than as literature, provide an invaluable reference guide for the theatre profession and a detailed, objective account of individual performances for posterity. With the technology available, copyright issues had to be addressed. Margaret eventually established a unique agreement with Equity, BECTU (the technicians’ union), the Musicians’ Union and the Writers’ Guild, which allowed for a recording to be made and edited at a live performance, with an audience, without payment to artists or stage management. The public would be able to view the tapes by appointment, free of charge and there was to be educational – but no commercial – use of the recordings. Selection criteria were established, including artistic excellence, educational, historical or social significance, rarity, innovation, and works by significant writers, directors and designers. 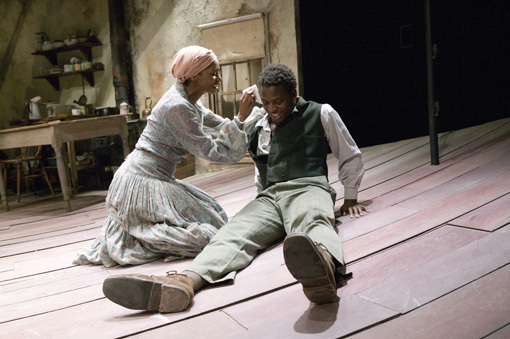 We would draw on the experience of critics, scholars and members of the theatre profession to counsel us. Roger Jenkins, an experienced television producer who was establishing the methodology for Margaret Benton, took advice from the theatre profession and decided that no editing should take place because it would impose a layer of artistic judgement that might conflict with that of the theatre director. The viewer would be told where to look rather than have the freedom to choose, as at a live performance. The only alternative would seem to be to record a single wide shot of the whole production, but if the tape was watched on the average sized monitor, the performers would be tiny within the frame (unless both venue and cast were very small); facial expressions and subtlety of performance would be lost as well as details of the set and costumes. Such a recording could only be used for reference, without any notion of enjoyment – which must be intrinsic to watching performance, and without which no justice can be done to a production. So Roger Jenkins decided that three cameras would be used, each filming a single choreographed shot. The tapes would be viewed on a pyramid of three monitors, so in principle, you could choose where to look, as in the theatre. In practice, it was impossible to make the viewing copies, playing on domestic playback machines, run in synch and of course it was tedious to stop and review a section or to fast forward or back – hardly ideal viewing conditions for a researcher. A BBC music director was brought in (as music, opera and dance, though not drama, were then regularly recorded live for television) to advise on an alternative system. Adapting the methods used for television outside broadcast (o.b. ), he recommended that two, three or four cameras be positioned among the audience and cabled to a van fitted with television recording equipment outside the theatre where a director would talk the camera operators through the shots and cut between the cameras, creating an immediate ‘live’ edited recording. 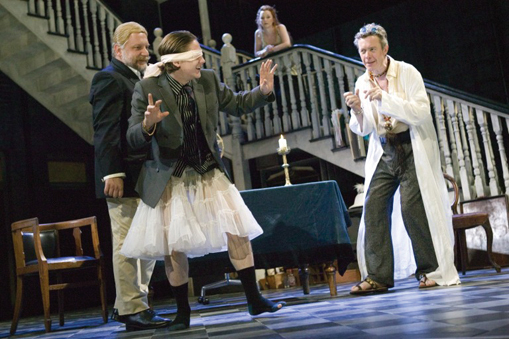 The immediacy of this method would better capture the spirit of the performance but the director would need to be well prepared and have spent time making a ‘shooting script’ using a ‘scratch’ tape or wide shot of the whole performance, filmed early in the run, and a copy of the stage manager’s prompt script. The quality of the sound would be crucial and a sound supervisor would need to place microphones as near the actors as possible, which would involve battles with stage management who want neither cast nor audience to see microphones. Radio microphones would not be appropriate unless the actors were already using them. An o.b. van was important because of the inability of cameras to deal with theatre lighting, which is often too bright or too dark. Equipment in the van enables a skilled engineer to compensate for the extremes of stage lighting and ensure that the cameras are colour balanced. •	Television loves fast editing. For an archival recording, edits should only occur when necessary – e.g. a character is about to move out of the frame of one camera, necessitating a cut to a wider shot to contain the action. There will be far fewer shots in an archival recording than in a feature film or television version. •	For those who object to the notion of an edited recording, or a technician wanting to check the lighting changes or a stage manager wanting to see the exits and entrances, the unedited wide shot should also be recorded on tape and made available for viewing if required. The issue of conservation is central to any archive. Our o.b. style recordings are made using Digibeta tape, which has long been the BBC’s archiving format and stored in climate controlled conditions. The constant evolution of formats is expensive and time-consuming but we are in the process of ditigising our masters and viewing copies onto a server, while also preserving the Digibeta masters. These then are the guidelines we have established after 15 years of experience. It is widely accepted that our archival recordings are as good as possible, when circumstances allow, and we wanted to celebrate this with our 200th recording. Six months before it was due to transfer to London, the RSC, Ian McKellen and the company gave their permission for us to record King Lear. Then we came up against what is often our biggest obstacle: acquiring the appropriate seats for the cameras. We have to buy up to ten seats for each camera to ensure that no-one in the audience is behind or beside one. This often means we have to reserve seats before public booking opens, to get large blocks of seats in the right places. King Lear was to transfer from Stratford to the New London Theatre in Drury Lane, which was being refurbished and the auditorium reconfigured into a thrust stage. Despite being six months ahead of the game, because the seats were to be taken out and not replaced until weeks after booking had opened (it was expected that the theatre would sell out within days) we were unable to select our camera positions (in an auditorium without seats) and so we were unable to record King Lear. Our 200th recording was in fact Typhoon Live, a double bill by the Yellow Earth Theatre company of a Singaporean play and a Korean play, at the Oval House. This, like Gem of the Ocean and The Birthday Party, was a different type of recording, made more simply, cheaply and with less guaranteed success. If conditions are right (the venue and the cast small enough and the lighting even throughout) it can be a valuable addition to the archive. These recordings are made by two or three camera operators working without the benefit of a director or an engineer. We use small DV cameras often working side by side at the back of the stalls (small theatres tend not to have the overhanging circles typical of Victorian theatres which impede the view from the back). All three cameras must be operated and the expertise of a professional sound recordist is essential. The tapes are edited in postproduction and the editor may have to try to balance the colour of the cameras. The Birthday Party was shot at the Duchess Theatre on only two cameras, one taking the wide shot, one a closer shot. The editor has less choice and the recording is less interesting to watch but there is an argument that the result is more theatrical, because the cameras are viewing the action entirely from the front, like the audience, rather than cross shooting into the actors’ eyelines, as television does. Although it was an o.b. recording, we filmed The Rhinoceros at the Royal Court recently on only two cameras, because it was an ensemble piece interspersed with dialogue between actors sitting close to each other. Two cameras are inadequate on any stage larger than the Royal Court. We will also shoot on a single camera for a one-person show, or where the action is sufficiently slow moving that there is time to zoom in slowly (the only occasion we allow zooms – the eye doesn’t zoom) during a soliloquy, or into a group, without losing any action on stage. On these occasions, the script needs to be annotated for camera moves and the camera operator directed throughout from somewhere backstage, the director using a monitor and headphones. So every production has different requirements: one, two or three cameras (four for musicals) in either the o.b. set up or the post-production editing set up depending on the size of the venue and the cast and the complexity of the staging. The other production we had hoped to record for our 200th was Michael Grandage’s production of Othello at the Donmar. We had recently made a successful recording of Absurdia at the same theatre and Michael Grandage had professed himself delighted with our recordings of his Don Carlos and Suddenly Last Summer. But the answer to our request to film Othello was: ‘this production needs to be allowed just to exist here, as a live event’. Archival recording has been dubbed ‘the best betrayal’ and Peter Brook took decades to accept its usefulness. Sir Richard Eyre still rejects the idea that an ephemeral art such as theatre should ever be fixed in time, believing that a new art form has to be created, the play taken out of the theatre into a studio, relit and restaged. We make no pretence that a recording can do more than approximate the experience of live performance – and then only if it is a good recording. We are not creating art; we are trying to create a faithful, detailed, objective – and enjoyable – account of the great art that pours out of our theatres, and is otherwise lost forever. Accessing NVAP recordings: A full listing of all the productions recorded by the NVAP project can be seen on the V&A Theatre Collections website at: www.vam.ac.uk.